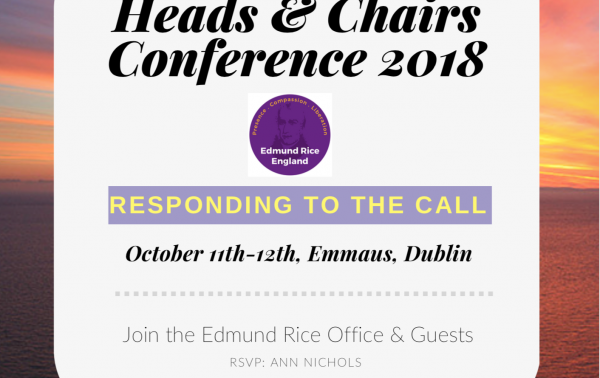 Heads, Chairs, Brothers and invited guests – please let us know as soon as possible if you are able to attend and fill in the accommodation form you have been sent as requested. O God, we thank you for the life of Edmund Rice. He opened his heart to Christ present in those oppressed by poverty and injustice. May we follow his example of faith and generosity. Grant us the courage and compassion of Edmund as we seek to live lives of love and service. The Edmund Rice Network, England, is committed to the Safeguarding policies of the Catholic Church in England and Wales, to take all reasonable steps to protect children, young people and vulnerable adults from any form of abuse or maltreatment and to promote a safe environment for them. This commitment flows from the fact that we are all made in the image of God and the Church's common belief in the dignity and uniqueness of every human life. We start from the principle that each person has a right to expect the highest level of care and protection, love, encouragement and respect that we can give. We will liaise closely and openly with statutory agencies to ensure that any concerns or allegations of abuse that are raised are promptly reported and properly responded to, victims supported and perpetrators held to account.